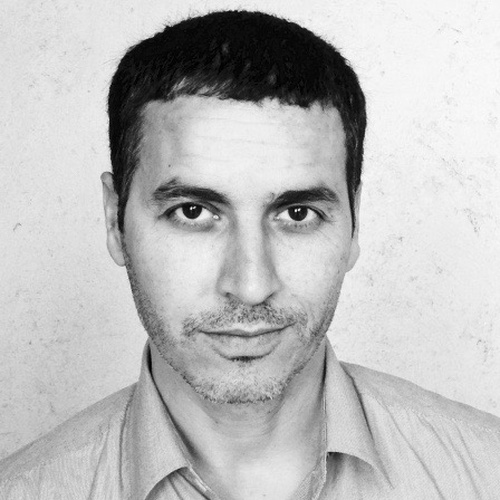 Abdellah Karroum is founder and artistic director of a number of initiatives, including L’appartement 22, an experimental space for exhibitions and artists’ residencies founded in 2002 in Rabat; the Le Bout Du Monde art expeditions (2000 – ongoing); the éditions hors’champs series of art publications (1999 – ongoing); and R22 radio, an experimental web radio station. He was curator of Sous nos yeux, La Kunsthalle de Mulhouse (2013) and at MACBA Barcelona (2014); associate curator for La Triennale, Paris(2012); and artistic director of the Biennale Benin (2012). Other curatorial projects include the Sentences on the Banks and other activities, Darat Al-Funun, Amman (2010) and 3rd AiM International Biennale, Marrakech (2009). He initiated the laboratory Art, Technology and Ecology at ESAV-Marrakech (Film School), which has run monthly since March 2010. As the Director of Mathaf, he has created the Project Space, which brings the museum into proximity with the university and experimental educational programming. He is the author of a number of articles and books on artistic practices and tendencies, introducing the concept of Generation 00 and Curatorial Delegation. He received several grants and he participated in juries and curatorial residencies at the Venice Biennale, AIT Tokyo, Arab Fund for Culture, Doual’art (Douala), The Clark Art Institute (USA), and IASPIS (Stockholm), among others.